﻿ Eurotel Pedro Gil Hotel, Manila | FROM $27 - SAVE ON AGODA! "Very nice & hard working staff!" Have a question for Eurotel Pedro Gil Hotel? "Location was good especially to shopping lover"
"Location is great (near Robinson Manila and LRT station Pedro Gil)." "The room was big and ambiance is nice." "Great location and good staff." The Eurotel Pedro Gil Hotel is an excellent place to stay for an exciting vacation. The rooms here overlook the city for stunning views of Manila. This Manila hotel is close to Casino Filipino Malate Branch, Robinsons Place Manila, Manila Bay, Malate District, and Centennial Clock. If you want to spend the day relaxing and unwinding, you can get a massage nearby. Offering guided tours, the hotel is the perfect place to stay to learn about the area. It offers family rooms, so your whole family will have adequate space to hang out together. With safety deposit boxes and a smoking area, it provides numerous convenient features to make your stay more comfortable. The hotel has a golf course and a spa among other amazing facilities. It has a bar, a coffee shop, room service, and restaurants on the property, so you can choose to eat in or grab a snack. From luggage storage to laundry services, the Eurotel Pedro Gil Hotel has a variety of useful services, ensuring that you get the most out of your visit to Malate. There's free Wi-Fi available in all rooms, as well as Wi-Fi in common areas, so you don't have to spend money on a local sim card while abroad. This Manila hotel permits pets, so you don't have to worry about finding someone to look after your pet while you're on vacation. When you get up in the morning, you can have a free, delicious breakfast. The front desk is open at all hours, so there will always be a member of staff behind the desk to answer any questions that you have. Check-in is offered from 12:59 PM, and check-out is from 11:59 AM. The Eurotel Pedro Gil Hotel provides a range of transportation options, such as airport transfers, car rentals, shuttle services, and taxi services, so you can enjoy easier access to all the must-see destinations around the city. Pedro Gil LRT Station is 430 m away and Quirino LRT Station is 900 m away. The nearest airport is Ninoy Aquino International Airport (MNL) which is 25 min away. This hotel provides an express check in and check out service, allowing you to avoid the frustration of waiting in long lines when getting ready to catch a train or plane home. "The breakfast that they serve was excelent"
Nice clean hotel on busy area across Robinson's Mall. The only complaint is the hotel massage service is 400 pesos an hour. If you bring in outside massage service the hotel will charge the massage girl 200 pesos. Thank you.Hope to served you again. best to stay for travelers, meetings..enjoy the full pack breakfast meal...we stayed twice here and stay again if we have travels in manila. Thank you for the very kind staffs. Linen was clean but old. We had to ask for tissue paper. Sinigang na hipon was not sour enough. We appreciate your feedback.Hope to served you better on your next visit.Thank you. Booked a room with a large double bed got two single beds pushed together with only a sheet over them. They parted in the night and also the foam mattresses were very thin and slipped off the bed. Beds had just a wooden base mostly uncomfortable. There was no temperature control for the Air Con it got cold in the night and there is no blanket to keep you warm. Breakfast was included but as a westerner there was nothing to eat except toast. In Addition the spigot on the shower fell off it obviously been broken and just taped up. We're sorry you were unhappy - we'll work hard to fix the issue you experienced. Thank you for letting us know. We like to stay at Eurotel, and this makes 8 years in a row. I wish the smokers did not set and smoke at the walk up entrance to this Hotel. The smoke is dangerous to everyone’s health and hard to avoid. Close to everything. Great shower head size in room. The only thing that let it down was no hot water. If u like hot water, dont stay here. Breakfast was very average as well. I went to McDonald actually down the road. Locals love it but not set up for foreigners. The inadequate shower is enough for me not to recommend to a friend. Located right across from Robinsons Place mall. Very nice & hard working staff! The 4th floor maid arranged everything. Only minus is bedding & foam mattress not comfortable. Should have a nice armchair top. Pros: very near to Robinson Shopping Mall just across the street! I stayed eurotel years ago.. it was awful, To my surprise the whole hotel was renovated and modernised now. I stayed in cheap room, standard room for two days. It’s worthy, Robinson mall across the road money changer Along the left corner choose any money changer you like. It’s a good place for budget place..I recommend it. We appreciate your feedback.Hope to serve you again.Thank you. We appreciate your feedback.Hope to served you better again on your next visit.Thank you. Everything was great except our room had a bathtub that was rusty and didn't have a drain plug. The chrome shower felt like it would fall off any moment, literally. They need to up their maintenance. During breakfast buffet, my husband's glass had lipstick marks on it that weren't washed off. We called the attention of the staff and I am really hoping they told management about it. Their buffet breakfast wasn't as good as it used to be so I guess there is a need to keep things as they used to. BUT staff was super nice especially the people at their front desk. The best thing about this hotel is its location. I think they gave us an old room, despite having renovated rooms. Our room was smelly, and the toilet was leaking. I've always loved Eurotel, but this one was a disappointment. This is our 2nd stay at this hotel. The Suite room is not as nice as it shown in the pictures. It's not that clean, it looks old and the wall is not concrete, the aircon cover fell off, the tv is so small, the remote control is not working and it has limited channels. But we enjoyed the bath tub. The free breakfast is great too! We'll definitely stay here again because of its accessibility to malls and transportation. 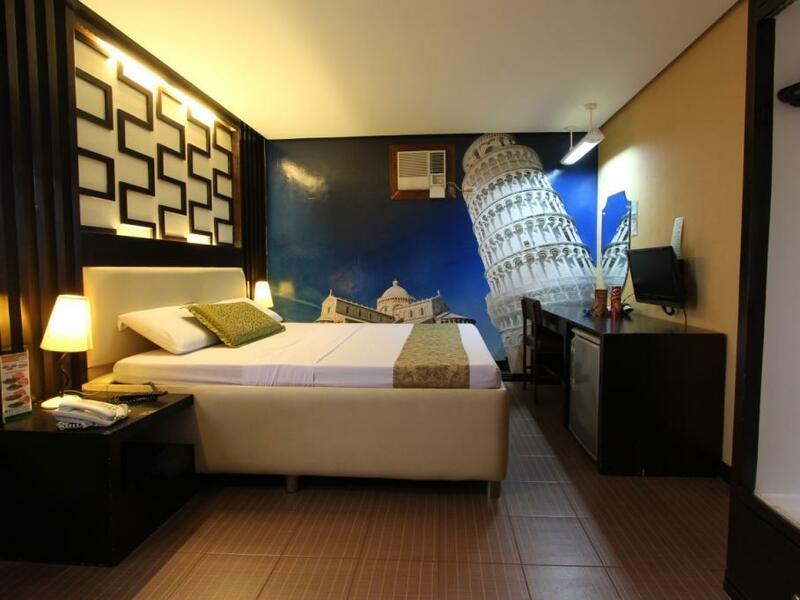 Located near Robinsons Manila, Mini Stop, Laundry Shops and Restaurants. Near Pedro Gil station. The room I took is there studio room and its small for couple. Bathroom is clean and you can ask for make up everyday as you please. Affordable price via agoda. Stayed here before and it's my go-to hotel when traveling alone in Manila. Very close to family and right across the street from Robinson's Manila. Plenty of restos and shopping. Would definitely come back here. Friendly staff. Free breakfast. Thanks. It is good for someone traveling in and out of the city not wanting to schlep all his bags around if doing one or two day trips about the region or out of country. Staff is very helpful. Facility is very quiet as well. We're sorry you were unhappy - we'll work hard to fix the issue you experienced. Thank you for letting us know.Hope to served you better on your next visit.Thank you.